This is a great little tip that I want to share with everybody. Smartphones are becoming great tools for organisation, learning and study. There are many different applications available for learning languages and many for Chinese. 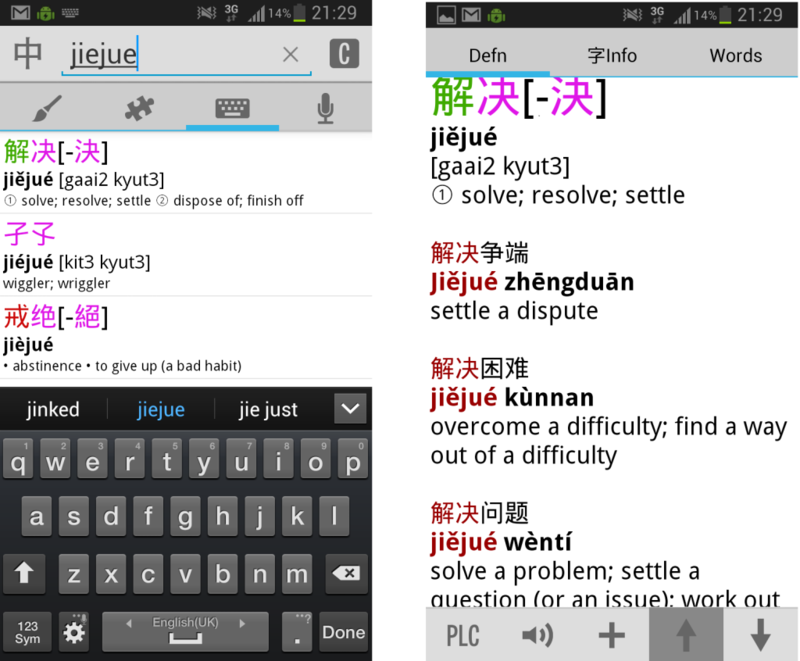 Pleco, however, is one of the best tools available for Chinese learners. It is a dictionary, a text reader and a flashcard tool. Pleco is available for iPhone / iPod Touch and iPad, as well as Android (so it works on my Samsung phone too). I have used this bit of software for years now, and even though I have been learning Chinese for more than six years, I still use it a lot to check bits of vocabulary and pronunciations of characters. To get Pleco, just search for it in the Apple App Store or Google’s Play Store. The basic app is completely free, and includes a very usable dictionary. The matches for the string you have entered will then appear. You can click on definitions to see them in more detail (right). You will notice that different tones are colour coded (colours can be changed in settings) to make them easier to memorise. That’s not all this clever little app can do, though. If you buy the character recognition add-on (as far as I remember it is not very expensive) then you can click the brush icon at the top of the dictionary screen to write characters that you want to look up. The recognition system is licensed from a Chinese company, and it works really well. You don’t even have to get the strokes in the right order for it to recognise the character, which is great for beginners. Simply click the brush icon, write the character as best you can, choose the correct character from the choices at the bottom of the screen, and click ‘Done’ to look it up. This is a great feature: much quicker than learning to use a paper dictionary, and the best thing is that you can put the dictionary into your pocket, pull it out in the middle of a Chinese restaurant and start getting to grips with that menu! The process of actively looking up words and characters will help you to remember them. If you are like me, you will probably end up looking up the same word six times before you remember it, but in the end it will stick! Before you know it, you will be familiar with a lot more characters, and you’ll have beaten that restaurant menu for good!